All people, regardless of age or disability, should be able to live independently and participate fully in their communities. Every person should have the right to make choices and to control the decisions in and about their lives. This right to self-determination includes decisions about their homes and work, as well as all the other daily choices most adults make without a second thought. In survey after survey, when older adults and people with disabilities are asked where they would prefer to live, they say they want to live in their communities, not in institutions. Many people have deep ties to their communities that go back decades, if not generations. Remaining in the community allows people to preserve a critical connection to meaningful memories, people, places, and things. These connections with the familiar can be particularly important for older adults. Living in the community can also offer a level of social connection that is hard to find in a nursing home or other institutional setting. It offers the opportunity to interact with family members, friends, and neighbors. Being integrated in the community means having the opportunity to live with, and work alongside, people of all different abilities. Community living offers many benefits for individuals and their families, but it also offers many benefits to the communities themselves. Communities miss out on valuable voices and perspectives when people with disabilities and older adults are left out. They are deprived of co-workers, volunteers, mentors, and friends who offer new ways of thinking about, and navigating, the world as well as wisdom collected over many decades. Older adults also often serve the critical roles of family historians and keepers of a community's memories. Not only is community living rewarding for individuals and communities, but also happens to be less expensive than other options for most people. Skilled nursing facilities can cost an average of $75,000 a year and public residential facilities for people with disabilities average $225,000 a year. In most cases, these costs are not covered by Medicare or private health insurance. Finally, a series of laws, court decisions, and administrative rules have established community living as a legal right. Most notably, in 1999, the U.S. Supreme Court ruled in Olmstead v. L.C. that people with disabilities must receive services in the most integrated settings possible. This landmark decision has been a critical tool in protecting the rights of people with disabilities and older adults alike. Many older adults and people with disabilities need help with the daily tasks of life. For some people this is physical help such as help with dressing and eating. For others, it is help with making decisions and planning. Still others require a blend of supports. Each person is unique, and the help they may need is unique as well. At ACL, we believe that the preferences and needs of older adults and people with disabilities who need assistance belong at the center of the system of services and supports that enable them to live the lives they want to live. We further believe that those needs and preferences should be defined by the individual receiving services and supports. 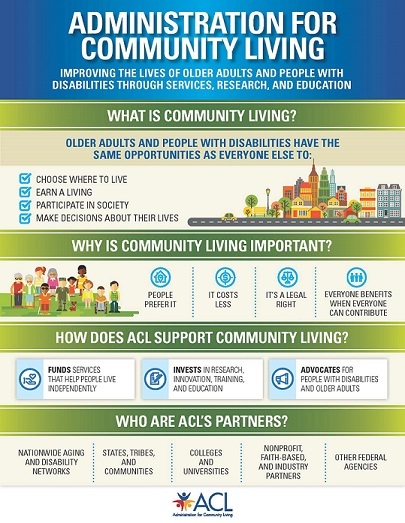 At the same time, ACL recognizes that some people with disabilities and some older adults experience challenges in understanding and communicating their preferences and needs, and family members and caregivers often play a critical role in ensuring that those preferences are honored and needs are met. We also recognize that the preferences of the individual are not the only factor in determining how to best support that person. The availability of services and supports in a variety of settings, the resources and availability of family caregivers, and other factors also must be considered. The realization that you or someone you love will need additional services or supports to stay in the community can feel overwhelming, especially after an unexpected event such as a fall or an accident. Many people do not know what services are available, to whom to turn for help, or where to start. In many states, Aging and Disability Resource Centers can act as a gateway to a broad range of services and supports for older adults and people with disabilities. For people with disabilities of all ages, Centers for Independent Living are a great first stop. These community-based centers are run by and for people with disabilities and offer a broad range of services to empower and enable people to stay in the community. People with disabilities of all ages may also benefit from assistive technology (AT) devices and services. AT includes everything from “low tech” helping tools like utensils with big handles to high tech solutions like talking computers. Every state and territory has an Assistive Technology Act program that can help people find, try, and obtain AT. For older adults, ACL's Eldercare Locator is a great place to start. Visit www.eldercare.gov or call 800-677-1116 to be connected with your local Area Agency on Aging or Aging and Disability Resource Center. Those organizations can help you understand what services are available in your community and help you sign up. A number of other resources are available to help you find and access services in your area. Our Find Help page can point you in the right direction. For a video overview of community living and ACL's mission, watch this video.